New meets sorta-new with these fresh IPAs. Every January, I take a break from alcohol—mostly to prove that I'm the boss of the beer in my life, not the other way around. However, when I do get back on that wonderful beer wagon, IPAs are my go-to beers. They're just so flavor intensive, and I love that tingling I get on the sides of my tongue at the first sip. Luckily, two new IPAs were awaiting me on my first day back. Uinta Brewing Co. Clear Daze Juicy IPA: It pours just like the name describes—clear, with honey tones bordering between orange and amber. As soon as I finish pouring, I can smell the fruit basket this beer imitates. Pineapple, mango and tangerine smells swirl around, and doses of orange and tropical fruit-driven hops dominate the aroma. This beer smells damned good. The flavor profile might not be quite as vibrant or bright as the nose, but it's certainly close. The tropical fruits get it started again with pineapple and mango flavors; the tangerine and big, fleshy orange show up in the middle, but not before that softly sweet, almost lactic, sugar-cookie sweetness hits. It's funny the way the bright orange and sugars combine. A whisper of herbal, earthy hops hows up at the end. The finish dries up after 10 or 15 seconds and leaves behind a bitterness that grows but never surpasses moderate. The mouthfeel and 6 percent alcohol fit well and actually make this beer quite dangerous. It's on the lighter side of moderate with a snappy, possibly slightly overaggressive carbonation. Overall: Clear Daze is the way to do it in the Northeast style, if you don't want all of those unnecessary turbid calories. The flavor is interesting and fun to be around, and that giant nose of bright fruit is enough to make you smile. Give this one a go. Wasatch Brewery West Coast IPA: This is part of a new series of beers made exclusively at the original source, Wasatch's Park City brewery, helmed by head brewer Nils Imboden. This West Coast-style IPA pours a hazy, golden, amber-light orange color, with two fingers of dense and rocky off-white head. Very nice aromas emerge, with a good balance and complexity of bright citrusy, fruity, and piney hops and moderate pale malt notes. The taste starts with big grapefruit, tangerine and pineapple. More domesticated fruits emerge from there, with peach, apricot and melon popping up from the malt-and-hops combo. As we approach the end of the flavor palate, lemon zest, orange peel, pine and light honey round out all of the aforementioned flavors. The finish has a nice assertive bitterness that builds upon the more grassy and resinous pine elements. There is a moderate dryness from that bitterness with a very smooth, balanced, sticky, resinous and fairly grainy and bready mouthfeel, with zero warming alcohol for 6.5 percent. Overall, this is a great IPA. The all-around complexity and balance make it very smooth and easy to drink. Despite its fairly aggressive bitterness and resinous dryness, it's a very enjoyable offering. Clear Daze is currently available in cans at Uinta Brewery Pub's adjacent bottle shop and should be making its way into beer pubs around the Wasatch Front. 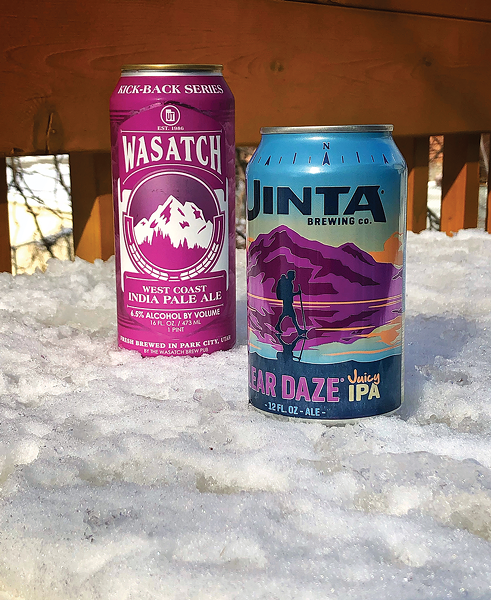 The West Coast IPA can only be purchased to-go at Wasatch's Park City brewery; however, it can be enjoyed in-house at most Wasatch and Squatters locations, so keep that in mind. As always, cheers!